In my residency training and beyond, I learned much from Dr. Kyuhyun Wang (here is his bio) and from his Atlas of Electrocardiography. It has finally been published for all to obtain. He is especially talented with rhythms, and a wizard with ladder diagrams. This is his first guest post. I will ask him for more in the future. What kind of AV block is this? The ECG tracing in Figure 1 shows (choose one from the list below). b) 2:1 AV block with AV junctional escape beats. 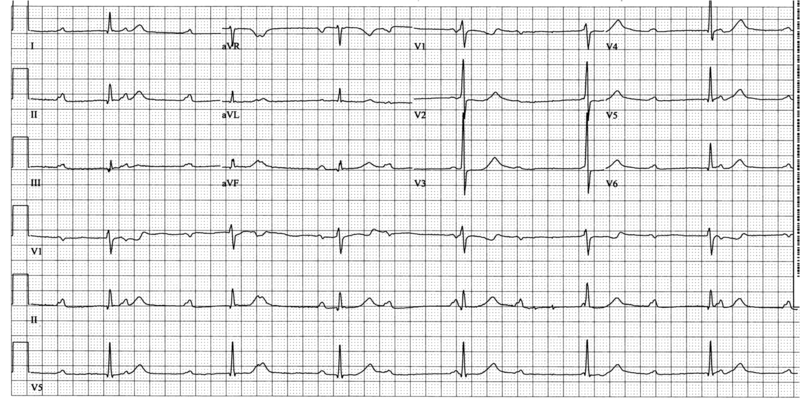 c) 2:1 AV block with AV junctional escape beats. Discussion: Narrow QRS occurs slowly at 37/min. 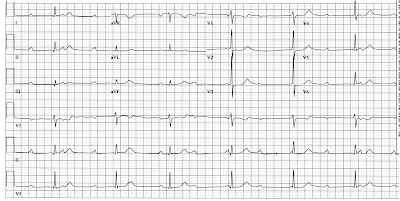 P-waves occur regularly at 74/min with no fixed relationship to the QRS, suggesting 3° AV block with AV junctional escape rhythm. However, R3 has a P-wave in front of it (P4) which appears to be conducted from that P-wave. This question, which is important, can be settled by measuring the R-R intervals, realizing that an A-V junctional rhythm is a very regular rhythm. 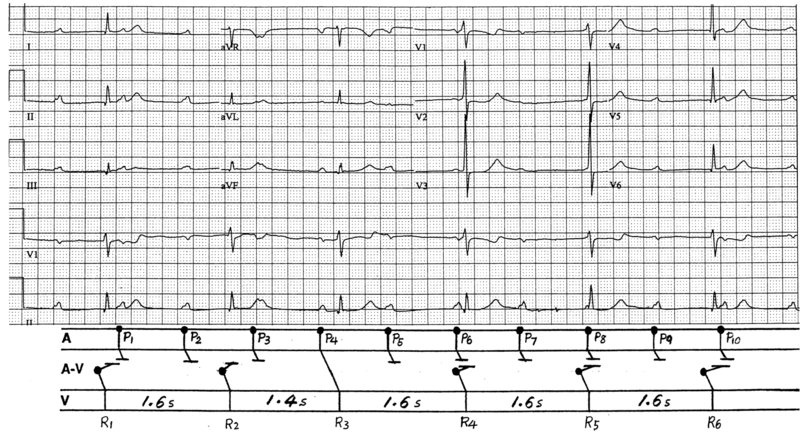 R3 occurs 1.4 s after R2 while all other R-R intervals are 1.6 s. 200 ms difference in R-R interval is sufficient and conclusive evidence that R3 is not a junctional beat but conducted from P4, proving that this patient does not have 3° AV block. What this patient has is 2:1 AV block. That is what is happening in this tracing as diagrammed in Figure 2. R3 is conducted from P4. The next P-wave (P5) is blocked because this patient cannot conduct at that R-P interval. The next P-wave (P6) was going to be conducted. How do I know that? This patient’s AV junction can conduct at 1.4 s as demonstrated by R3. R3-P6 interval is certainly longer than that assuring that P6 would have conducted to the ventricles if it weren’t for the junctional escape beat (R4); thus, the diagnosis of 2:1 AV block is securely established. This repeats again and again. 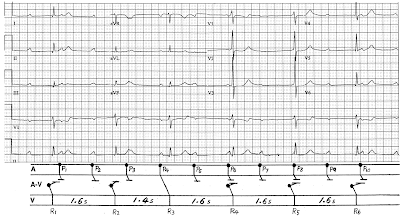 If, later, a P-wave occurs with a conductible R-P interval which is shorter than AV junctional escape interval (1.6 s in this patient), that P-wave would conduct to the ventricles as P4 did. These junctional escape beats occur close to sinus P-waves during each other’s refractory period and AV dissociation (not necessarily AV block) results with those beats. A given ECG tracing can be dissected into the primary disorder and secondary responses. AV junctional escape and AV dissociation are all obligatory secondary responses. Sometimes these secondary manifestations make the tracing look more complicated and eye-catching. A good example of the same situation was posted at “theheart.org” arrhythmia/EP section “ECG of the month” program in 2/2012. It generated a lot of heated debate even though it was easier to visualize than this case because a tracing was available when that patient actually was in 2:1 AV block with a faster sinus rate. These two cases (this one and the one on theheart.org is another demonstration of how not every complex that has AV dissociation is demonstrating AV block. Here is another case posted in June 2011.